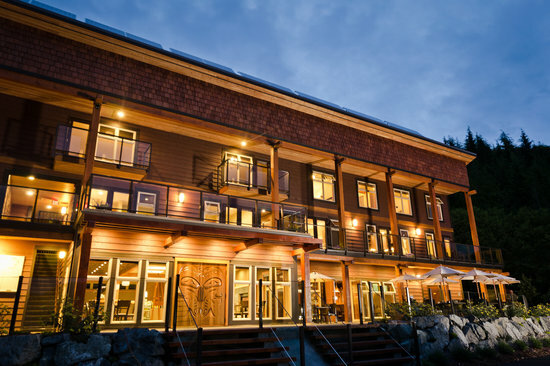 Set in the sheltered waters of Nootka Sound’s Moutcha Bay, this secluded upscale waterfront resort lies 25km from Tahsis and 43km from Gold River. It is easily accessible by road, boat, or float plane. The Resort offers spacious lodge suites and waterfront chalets. Or, for a truly exceptional west coast experience, book a stay in a luxury yurt overlooking Moutcha Bay. Serviced waterfront or treed RV campsites with hot showers and flush toilets are also available, with complimentary boat launch. Visit the Conuma Grill in the main lodge for breakfast, lunch, or dinner for locally sourced west coast fare. The secure, full-service marina includes moorage slips, fuel, bait and tackle sales. Guided fishing charters, boat rentals, and a government-certified fish processing facility are available. Contact Nootka Marine Adventures’ Guest Services for more information: 1-877-337-5464.